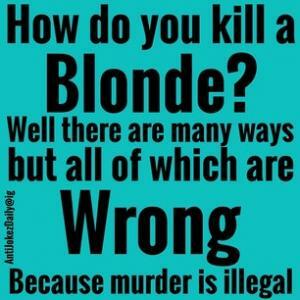 what do screen doors and blondes have in common? the more you bang them, the looser they get. How do you exhaust a blonde? Put her in a round room and tell her there is quarter in the corner! Q: How do you recognize a blonde at a car wash? A: He's the one on his bike. Q. Why is it good to have a blonde passenger? A. You get to park in the handicap zone. Q. What did the blondes right leg say to the left leg? A. Nothing, they haven't met! Q: What does a blonde say after having multiple orgasms? How do you keep a blonde busy? A: Write "Please turn over" on both sides of a page and hand it to her. Q: Why was the blonde girl sitting on the roof? A: Someone told her drinks were on the house.